As if self-driving cars don’t sound dangerous enough on the surface of it. 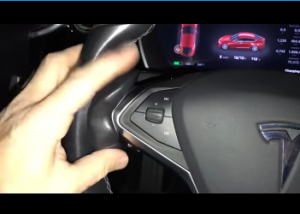 Well, one supposed ingenious aftermarket inventor came up with the idea of making a device to trick Tesla’s autopilot system into thinking a driver’s hands are still on the steering wheel, when in fact they are not. The device called the Autopilot Buddy and sold for $199 on the Internet. This black piece of plastic mimic what human hands feel like to the Tesla Models S, X and 3 autopilot system. Autopilot Buddy, which has a product number of #1776, was being sold online for $199. The product itself it basically a piece of plastic that attaches to a Tesla S, X, or 3 steering wheel using powerful magnets, which gives the vehicle the impression that hands are on the wheel. According to one report by Jalopnik, the Autopilot Buddy was designed to trick the Tesla vehicle into thinking a driver’s hands were on the steering wheel and driver was still focused on driving. The Tesla cars are not fully-autonomous, but rather a Level 2, which requires a driver to constantly monitor the cars operations. In one of the company’s video’s, they claim the vehicle is for “track use only,” as if the consumer will only use it at a race track. What Are the Most Dangerous Driving Behaviors? Have you been injured as a result of a dangerous or defective product? If so, a Phoenix Product Liability Lawyer at the Law Office of Richard Langerman is here to defend your rights to compensation and justice. We’d be pleased to set up a free, no obligations initial consult with a Phoenix product liability lawyer, so call us today at (602) 892-4294 or send us an email using the contact form on this page. 1“Feds Declare Tesla Autopilot-Tricking ‘Autopilot Buddy’ Unsafe Because Yeah It’s Unsafe” published in Jalopnik, July 2018.